Undeniably, Jammu & Kashmir is a heaven on earth. With countless snow-clad mountains, immaculate atmosphere, exemplary valleys and impeccable landscapes, this exotic part of India is no less than a godly art. There are innumerable places in Jammu & Kashmir where you can feel your soul dancing in the rhythm of a cool breeze. Gurez Valley is one amongst them all, which certainly can be the best representative of Jammu & Kashmir. Situated at an elevation of 8000 feet above sea level and at an approximate distance of 125 km from Srinagar, Gurez Valley definitely deserves to be your next destination. Ever heard of it? If no, then here is your article. Get yourself amidst the unceasing beauty of this breathtaking valley and find out about the gems hidden in its fist. It is the central part and comprises of 15 villages dotted all over the Gurez Valley. Also home to the ruins of ancient Sharda University along the Kishanganga river, Dawar is the most-visited part of this entrancing valley. Surrounded by towering mountain ranges, the beauty of this place gets enhanced by the relaxing sound of Kishanganga river flowing through this valley. Get your soul here, indeed you will be flying high on the chariot of ecstasy. Named after Kashmiri poetess Habba Khatoon, certain tales of love for her husband revolve around this pyramid-shaped mountain. Apparently, it is said that she still wanders around this beautiful mountain in search of her husband. This gigantic pyramid is the major attraction of Gurez Valley. If you are looking to find yourself amidst the natural wonders of Jammu & Kashmir to get awestruck entirely, then this is a must-see spot in Gurez Valley. No matter what, you will not be able to hide yourself from Habba Khatoon. Ever walked over the flourished valleys and felt divinity in your close proximity? Well, here is your chance. Tulail Valley is situated at an approximate distance of 42 km from Dawar and is definitely a heaven for all the travellers. Home to few villages, Tulail Valley is popular for fishing and if you are looking to experience a little bit of a rural setting in this paradise, then it's your call. The memories cherished here will certainly become the part of your timeless album. 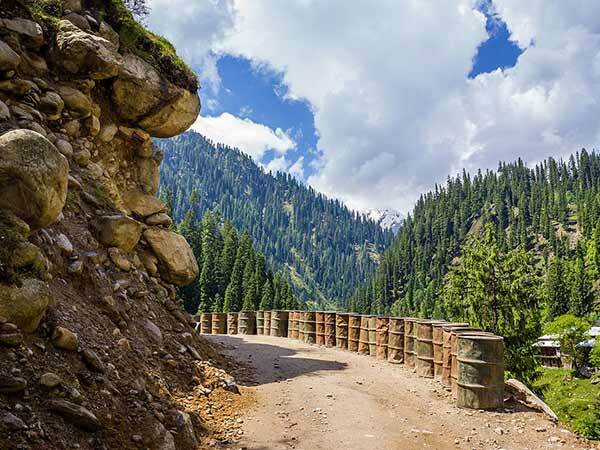 Located in between Sindh river and Kishanganga river, Harmukh, a part of the Himalayan range, is a massive mountain with an elevation of 16870 feet. For Hindus, Harmukh is considered a very religious and sacred mountain on account of it being the abode of Lord Shiva. With Gangabal Lake at its base, it provides quite spectacular views to the visitors. If you desire to savour it's persistent magnificent, then be on the way to this unforgettable journey. Once you are through this door to heaven, you will come across countless beauties to adore and appreciate. You can also visit shrines of Baba Darwaish and Baba Razaaq and the grave of Peer Baba. Apart from relishing moments of scenic beauty, you can also do rock climbing, fishing and trekking.